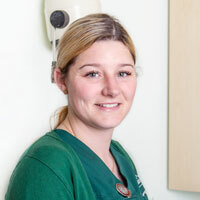 Rebecca started working with us in June 2011 and is a qualified Veterinary Nurse. She owns 2 Cocker Spaniels called Charlie and Lola and a horse called Beano and a Bedlington Terrier called Toby. In her spare time she enjoys competing with Beano and dog walking.